New Zealand downed Canada 26-14 in the final of the Emirates Airline Dubai Rugby Sevens, posting its fifth straight tournament win. While New Zealand built its lead atop the HSBC World Rugby Women’s Sevens Series standings after two of six events, Canada vaulted over the U.S. to move into second spot. 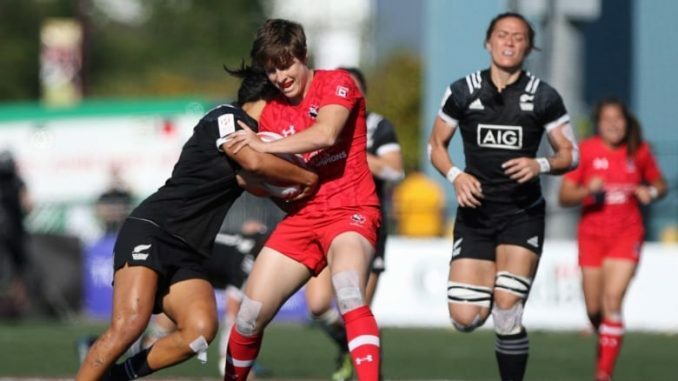 The Canadian women have won 10 of 12 matches this season, losing only to the Black Ferns. “Canada, they’re just getting better and better,” said New Zealand’s Tyla Nathan-Wong, named player of the final. Canada pinned New Zealand deep off the opening kickoff. But the Black Ferns patiently worked the ball out with Theresa Fitzpatrick bursting between two Canadians after collecting the ball from a ruck to race to the goal-line for a 5-0 lead. Canada responded with Ghislaine Landry’s kick finding Britt Benn behind the New Zealand defence. Benn was eventually hauled down just metres from the line but Landry finished it off. Her conversion gave Canada a 7-5 lead. A Canada turnover led to a Nathan-Wong converted try at the strike of halftime for a 12-7 New Zealand lead at the break. Gayle Broughton extended New Zealand’s lead early in the second half with a slashing run after Canada was penalized at the breakdown. Canada responded with a lung-busting run from Julia Greenshields that cut the New Zealand advantage to 19-14 with just over four minutes remaining. Bianca Farella was sinbinned for a high tackle on the ensuing kickoff. New Zealand took advantage with Fitzpatrick feeding Nathan-Wong for a second try and a 26-14 lead. A break by Landry moved the Canadians up the field but New Zealand captain Sarah Goss won a penalty at the breakdown, allowing New Zealand to run out the clock. Goss was named player of the tournament. Benn and Farella were named to the tournament “Dream Team,” by World Rugby Broadcast commentators. Canada’s last tournament win was in France in May 2016 when it beat Australia 29-19 at the final stop of the 2015-16 season. Canada opened the day with a 24-7 win over Ireland in the Cup quarterfinal before edging defending Series champion Australia 15-10 on a last-ditch Farella try. Benn and Landry scored the other tries for Canada, which led 10-5 at the half. That set up the final showdown with New Zealand, which advanced by blanking Russia 31-0 and the U.S. 22-0 in the knockout rounds. Australia defeated the U.S. 26-21 in the third-place match. New Zealand and Australia had split the six previous Dubai finals. Canada was coming off a third-place finish in Glendale where it went 5-1, losing 28-19 New Zealand in the Cup semifinal before beating France 28-0. Canada opened Day 1 of men’s play Friday with losses of 26-12 to England and 31-19 to Australia before beating Japan 27-7. Matt Mullins and Justin Douglas scored tries for Canada, which led England 14-12 at the break but could not hang on. England’s Dan Norton collected his record 300th try in the match. Connor Braid scored two tries and Luke McCloskey added a single in a losing cause against Australia. Andrew Coe had two tries and Douglas, Nathan Hirayama and Pat Kay also scored in the win over Japan. A top-four finish this season means automatic qualification for the 2020 Olympics. Failure to do that means having to go to a regional qualifier.